Hishamuddin Md. Som obtained his Bsc in Business Administration and M.B.A. from University of San Francisco, United State Of America and a PhD in Human Resource Management from University of Stirling, United Kingdom. 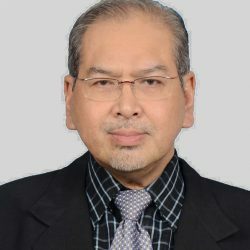 Prior to joining Academia at Universiti Teknologi Malaysia in 1989, he has had extensive experiences in various capacities in the manufacturing sector and as a banker for Standard Chartered Bank, Empire of America (San Francisco, USA) and Central Bank Malaysia . He is an editorial board member of several journals and have held several administrative posts as Assistant Dean (Postgraduate Studies) & Head Of Department as well as a Senate member and Committee members at the University & Faculty level of various universities. He is actively involved in numerous research and consultation activities at home and abroad and has also written several books and published in refereed international and national journal as well as proceedings. Due to his intense desire in pursuing personal transformation, performance excellence and leadership development, as an Accredited Trainer (ATP, UK) and a Certified HRDF/PSMB trainer, he conduct and facilitate courses and training programs for various organisations and institutions in Malaysia. Apart from being a Certifed Human Resource Practitioner (CHRP), a certified practitioner/coach in Neo NLP/NLP (Neuro – linguisitic programming), a Reiki Master (Sufi Hikmah and Kundalini) he possessed numerous certications related to profilingand human potentials which reflect his strong passion in personal development specifically on areas related to ‘ESQ’ (Emotional Spiritual Quotient), ‘MINDPOWER’, ‘BIOENERGY’ and “AURA. He is currently a professor at Putra Business School.